Cleaning glass artwork doesn’t have to be a complicated process, but without a proper understanding you may end up damaging your one-of-a-kind piece. The rise of glass art has been swift in the last ten years, with areas like St. Pete seeing glass art galleries popping up left and right. This increase in production has been a result of increased demand. As more people begin to purchase their first glass art pieces, a common question has emerged: how do you clean glass artwork to avoid damage and ensure it stays beautiful for years to come? Keep in mind there are many types of glass and they aren’t all created equally. 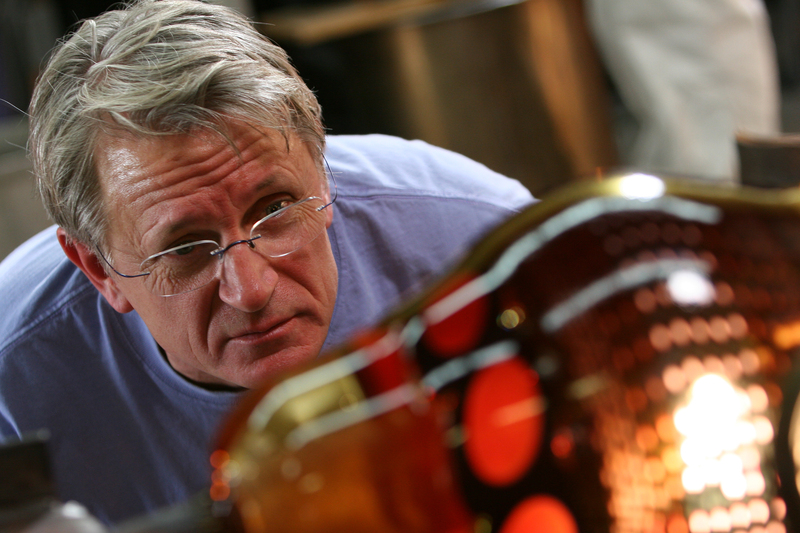 In this post, we will focus on how to clean hand blown glass art pieces since that is our specialty here at the Duncan McClellan Gallery. Let’s start with what not to do. If you avoid these glass cleaning sins, you can at least rest assured that you won’t damage your glass artwork. Avoiding scratches is harder than you think when it comes to cleaning glass artwork. While we think of glass as extremely durable, some glass pieces art quite delicate. For this reason, you should avoid using harsh cleaning cleaners and items like steel wool cleaning pads. Microfiber cloths will be your best friend when it comes time to clean your artwork. More on that later. Hand blown glass can be very sensitive to extreme heat or drastic changes in temperature. A dishwasher can get extremely hot in a short period of time. We have heard horror stories of people putting very expensive glass pieces in the dishwasher only to find them cracked when the cycle ends. While some glass pieces will survive a dishwashing cycle, we highly recommend that you avoid using the dishwasher to clean your glass art. The Jewelry on your hands and wrists should be removed before attempting to clean your glass artwork. It is common knowledge that diamonds can scratch glass. So can your rings, wedding band, and watch. It is easy to forget about your jewelry since you rarely take it off. In our experience, jewelry is one of the biggest culprits for scratched glass. If you regularly clean your glass artwork, chances are you won’t have to take drastic measures. Instead, you should always start with the simplest maintenance first. Dust: Use a feather duster regularly to remove dust from your glass artwork. Don’t have a feather duster? A soft, dry paintbrush is a great replacement and can help dust the harder to reach areas. Fingerprints: Spraying a glass cleaner onto a paper towel is the easiest way to remove those annoying fingerprints that seem magnetized to your glass artwork. Microfiber cloths are another great way to safely remove imperfections without the need for a cleaner. Speaking of hard to reach spots, some glass art pieces have intricate details that are simply impossible to reach in. A can of compressed air has you covered! Simply spray the hard to clean areas and watch the dirt and dust blow away. Sometimes glass cleaner and cloth aren’t enough to remove fingerprints. If you have tried everything already mentioned and still aren’t happy with the result, it is time for the soap and water method. While there are plenty of fancy methods for cleaning, we have found everyday dish soap and room temperature water is adequate in most cases. Pro-tip: Put a folded up towel in the sink when cleaning your glass artwork to act as a cushion and protect it from minor falls. When glass gets wet, it becomes much easier to accidentally drop. Make sure to carefully dry your artwork after cleaning. The tap water you use to clean your glass artwork may contain minerals that over time can create water stains and damage. As mentioned before, not all glass is created equally. While this can act as a great guide for how to clean hand blown glass, we still recommend that you contact your artist or gallery to inquire about the proper way to clean your glass artwork.